Focal adhesion kinase (FAK) is a major signaling molecule involved in the control of cell proliferation, survival, and motility. FAK functions in focal adhesions to facilitate intracellular signaling by transmembrane integrins during adhesion. In the simplest mechanism of activation, FAK is recruited to clustered integrins following cell attachment to extracellular matrix components . Following recruitment, autophosphorylation on tyrosine 397 both activates FAK's kinase activity and creates a high-affinity SH2 binding site for cellular Src (c-Src) . Binding to FAK in turn activates Src's kinase activity; consequently, Src phosphorylates additional tyrosines in FAK which stimulates maximal FAK kinase activity [3, 4]. Integrin clustering and Src recruitment serve to activate FAK's kinase activity, however little is known about the downstream effects of this. A few proteins, including paxillin , Shc , and p130Cas , have been shown to be phosphorylated by FAK in vitro. However, increased levels of phospho-paxillin and phospho-p130Cas are detected in FAK-null mouse embryonic fibroblasts , suggesting an overlap with other tyrosine kinases such as Src and the FAK family member, Pyk2 . In an effort to identify FAK-specific substrates, we employed a novel in vitro approach in which a microarray with recombinant human proteins was subjected to an in situ kinase reaction with purified FAK. Among the many candidates identified, four proteins were confirmed in individual assays as novel in vitro FAK substrates. FAK was found to phosphorylate multiple molecules within the NFκB signaling pathway, including the major pathway component CHUK/IKKα, which was found to be phosphorylated by FAK both in vitro and in vivo. Further, we found that FAK kinase activity promotes both canonical and non-canonical NFκB signaling, partially through IKKα phosphorylation. The following reagents/kits were used: ProtoArray Human Protein Microarray v5.0 Kinase Substrate Identification Complete Kit (Invitrogen), full-length active Src (SignalChem), GST-FAK (Invitrogen), baculovirus-encoded Pyk2 (gift of Vita Golubovskaya, Roswell Park Cancer Institute [RPCI]), purified vitronectin (Advanced BioMatrix), purified GST-PTPN5[a.a.17-565] (ProteinTech), FAK inhibitor PF-573,228 (Sigma), TNFα (Abcam), Recombinant Light (Enzo Life Sciences). The following antibodies (Ab) were used: HA (Abm), MAb-4G10 (anti-phosphotyrosine [PTyr]) and FAK (Millipore), poY397-FAK (BD Transduction), GAPDH (Santa Cruz), p100/p52 (Cell Signaling). Spodoptera frugiperda Sf-9 cells (Xinjiang Wang, RPCI), HEK293T and MCF7 (ATCC, Manassas, VA), FAK+/+ and FAK-/- mouse embryonic fibroblasts (MEF) from a p53-/- background (T. Yamamoto and S. Aizawa, University of Tokyo), HeLa (A. Gudkov, RPCI) and MCF-7 (A. Bakin, RPCI). Sf9 were maintained in Grace's supplemented media with 10% fetal bovine serum, 1% Pluronic F-68 and penicillin/streptomycin; cultures were grown in glass flasks shaking at 165 rpm at 27°C. All other cells lines were maintained in DMEM plus 10% FBS and penicillin/streptomycin. Mouse FAK cDNA was cloned into pFASTBac-HTb (Invitrogen) between BamHI and KpnI sites to form pFastFAK. GST-PDCD6 was generated by cloning the full-length open reading frame as an EcoRI fragment into pGEX-5X-2 (GE Healthcare). GST-paxillin (chicken; a.a.1-151) in pGEX-5X was described previously ; pCR-HA-IKKα (Addgene #15469), pLUdR-puro-YFP-FAK-Y180A/M183A (FAK180) (gift of M. Schaller, West Virginia University), NFκB-Luciferase (NK-Luc; gift of E. Kurenova, RPCI); pCMV-Renilla (gift of A. Bakin, RPCI), pCMV4-p100 (Addgene #23287). Y->F mutants in untagged IKKα (gift of E. Kurenova) were generated by site-directed mutagenesis using the primers msIKKa-Y187F: TGTGGGAACATTGCAGTTTTTGGCCCCAGAGCTCTTT, msIKKa-Y198F: CTTTGAAAATAAGCCGTTCACAGCCACTGTGGATTATTGG, and msIKKa-Y500F: GAGAGATATAGTGAGCAGATGACTTTTGGGATATCTTCAG. FAK bacmid DNA was generated by transformation of pFastFAK into DH10BacTM (Invitrogen). Recombinant FAK bacmid DNA was then transfected into Sf9 using Cellfectin (Invitrogen), and these cells were used to generate high-titer baculovirus. Sf9 were infected with high-titer virus for 48 h, pelleted by centrifugation at 1K for 10 min at 4°Cm resuspended in PBS, then lysed in 2X lysis buffer (20 mM Tris-Cl, pH 7.4, 500 mM NaCl, 10 mM imidazole, 2% Triton-X100, 2 mM phenylmethanesulfonyl fluoride, Roche cOmplete® protease inhibitor cocktail) on ice for 30 min. Cleared lysate was added 1:1 to equilibration buffer (20 mM Tris-Cl, pH 8.0, 500 mM NaCl, 10 mM imidazole) prior to binding to Ni2+ columns (Thermo Scientific) for 30 min at 4°C. Columns were washed thrice with 20 mM Tris-Cl, pH 8.0, 500 mM NaCl, 50 mM imidazole, and FAK was eluted in buffer containing 500 mM imidazole. Imidazole was removed by dialysis and His-FAK was concentrated using Amicon® Ultra (Millipore) spin columns- 125 kDa cutoff. FAK was stored at -20°C in 50 mM Tris-Cl, pH 7.4, 150 mM NaCl, 0.5 mM EDTA, and 1 mM DTT. The ProtoArray® Human Protein Microarray v5.0 was probed according to the manufacturer's instructions: slides blocked in 1% BSA in PBS for 1h at room temperature were incubated in Invitrogen Kinase Buffer containing 10µCi γ-33P-ATP (Perkin-Elmer) with or without 100 nM His-FAK for 1h at 30°C. Slides were washed twice each with 0.5% SDS and ultrapure water, dried and exposed to film. Images were scanned, saved as 16-bit TIF files and uploaded to the Protoarray Prospector Imager (Invitrogen), and using Protoarray Prospector Analyzer (Invitrogen) software, positive hits (>1.5-fold over control; coefficient of variation <0.5, Z-factor >0.5) were identified by comparing signals within duplicate spots, measurement of signal-to-noise ratio, and comparison of signals to negative controls. GST, GST-paxillin and GST-PDCD6 were purified from BL21-pLysS as described previously . For FAK-IPs, lysates made from HEK293T cells expressing HA-FAK were incubated with αHA at 4°C overnight, then with 20 μl Protein A/G resin (Santa Cruz) for 1h. Beads were washed twice with RIPA buffer and twice with kinase buffer (20 mM Hepes pH 7.2, 5 mM MnCl2, and 5 mM MgCl2), then resuspended in 20 μl kinase buffer. 5 μl beads were reacted with substrate protein plus 10 μCi 32P-ATP at 30°C for 30 min, after which samples were subjected to SDS-PAGE. Dried gels were autoradiographed. Src, FAK, and Pyk2 IVK buffer contained 50 mM Tris-Cl pH 7.4, 10 mM MgCl2, 1 mM DTT, and 0.1 mM Na3VO4. For non-radioactive IVK assays, HA-IKKα-beads were incubated with GST-FAK and 10 mM ATP at 30°C for 30 min, and then analyzed for phosphate incorporation by PTyr immunoblot (IB). Cells were transfected with NK-Luc and CMV-Renilla, and stimulated with TNFα where indicated. Luciferase activity was measured using the Promega Dual-Glo Luciferase Assay System according to manufacturer instructions. In FAK-/- cells stably expressing the pLA-NFκB-Luciferase reporter +/- FAK180, equal numbers of cells were assayed for luciferase activity using the Promega Luciferase Assay System according to manufacturer instructions. The Protoarray Human Protein Microarray, containing 9,483 purified human proteins printed in duplicate on a nitrocellulose-coated slide, was used to identify FAK substrates by incubating with either purified FAK plus 33P-ATP, or with 33P-ATP alone. The known FAK substrates, p130Cas and Shc, were absent from the array, and two paxillin sequences listed were either incomplete or incorrectly annotated. As a control, we showed that FAK could phosphorylate GST-paxillin, but not GST, in custom microarrays (Fig. 1a, right). Normalizing to the positive control, PKCeta, which binds 33P-ATP directly (Fig. 1b), 43 candidate FAK substrates were identified (Fig. 2a). Due to manufacturing inconsistencies (Invitrogen communication), the data from blocks 1-20 were excluded from analysis, thus limiting the analysis to 6,322 proteins. Pubmed and Gene (http://ncbi.nlm.nih.gov) searches were used to assign functions to the identified proteins (Fig. 2). Substrates were grouped into 7 categories: Signaling (32.6%), transcription/translation (32.6%), tissue architecture (7%), protein processing/turnover (7%), mitosis (4.7%), survival (2.3%), and metabolism (2.3%). The functions of 5 proteins (11.6%) could not be assigned. The identification of many signaling proteins was expected based on FAK's role in many pathways, yet it is surprising that few of these candidates are involved in the signaling pathways known to typically cooperate with or be regulated by FAK, such as PI3K  and ERK/MAPK . Interestingly, FAK also showed a substrate preference for molecules involved in transcription and translation, processes in which FAK has not yet been implicated. If verified, phosphorylation of such factors may suggest entirely new FAK functions. Microarray screen for FAK substrates. a. Left: Autoradiograph image of control and FAK protein microarray slides. Right: Control microarray containing 1, 5, 10 and 25 ng/dot of GST or GST-Paxillin. b. Spot-pair signals from control and FAK slides block #40 (upper panels), with identified proteins, microarray positions and relative signal intensities (average pixels/pair) below. A-F, proteins with increased phosphorylation by FAK relative to control; G, positive control protein, PKCeta; H-J, proteins with equal or decreased phosphorylation levels in the FAK slide compared to control. Candidate identified FAK substrates. a. Identified FAK substrates categorized according to function groups. b. Percentage of FAK substrates based on functional grouping. In order to validate screen hits, we performed individual kinase assays with several candidate proteins known to function in pathways relevant to FAK biology. The secreted glycoprotein vitronectin (VTN) is an extracellular matrix component which plays a role in maintaining tissue architecture by mediating interactions between cells and the extracellular matrix. Two other proteins identified, Programmed cell death 6 (PDCD6) and Protein tyrosine phosphatase non-receptor type 5 (PTPN5), modulate cell survival through the regulation of apoptosis. PTPN5 was shown to positively regulate apoptosis through its dephosphorylation of Bak ; PDCD6 has been shown to promote apoptosis in ovarian cancer cells . Vitronectin, PDCD6 and PTPN5 were phosphorylated in FAK-IVK reactions (Fig. 3a - c). Src phosphorylated PDCD6 and PTPN5, although to lesser extents than FAK, and indeed, when normalized to Src or FAK autophosphorylation levels, PTPN5 seems to be a better substrate of FAK. In contrast, Pyk2 was unable to phosphorylate either protein in vitro (Fig. 3d - e) although it could phosphorylate paxillin. This suggests a degree of specificity for FAK within the FAK/Pyk2 kinase family. The relevance of vitronectin phosphorylation is less clear because these proteins are not found in the same cellular compartment (FAK: plasma membrane; vitronectin: extracellular matrix). However, at least two phosphotyrosine sites on vitronectin have been identified in cell/tissue lysates (http://www.phosphosite.org). It is unclear why FAK phosphorylates vitronectin, PDCD6 or PTPN5 with different efficiencies, yet we have noted that once normalized for equal protein concentrations, FAK phosphorylates many full-length proteins, such as paxillin, to a lesser extent than truncated versions of the substrates (e.g.- paxillin a.a. 1-151 used here). This suggests that in addition to motif preference, FAK phosphorylation might be affected by substrate conformation, specifically, by domains that affect substrate availability. We identified four potential substrates involved in NFκB signaling: MYB binding protein 1a (MYBBP1A/p160) , conserved helix-loop-helix ubiquitous kinase (CHUK/IKKα) , TNFAIP3-interacting protein 2 (TNIP2/Abin-2) , and TRAF2- and NCK-interacting kinase (TNIK) . 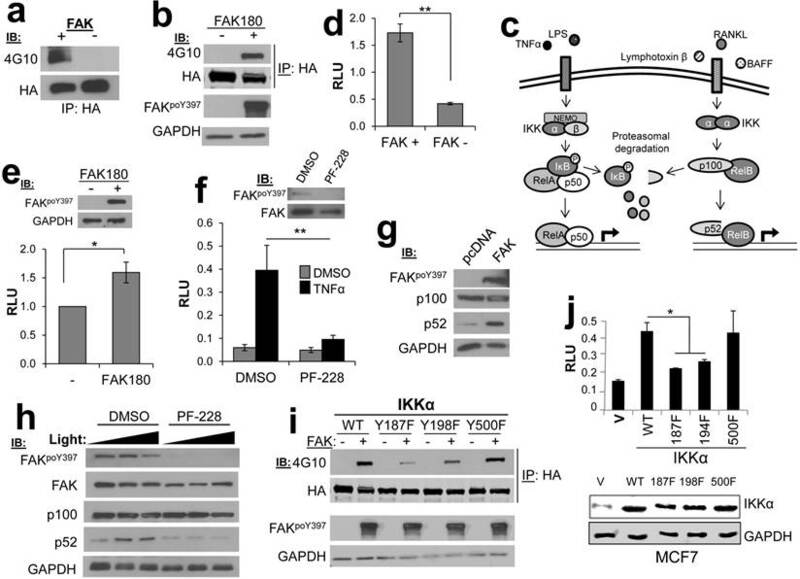 Previous studies have demonstrated a role for FAK kinase activity in NFκB signaling , including the ability of FAK to cooperate with NFκB to promote survival signaling . Indeed, IPs containing HA-IKKα expressed in HEK293T cells could be tyrosine phosphorylated in FAK IVK assays (Fig. 4a), and as well, HA-IKKα could be tyrosine phosphorylated when co-expressed in HEK293T cells with a constitutively-active version of FAK, FAK180  (Fig. 4b). IKKα facilitates both canonical and non-canonical NFκB signaling (Fig. 4c), in the former case, by functioning within an IκB Kinase complex to directly phosphorylate the negative regulator, IκB , and in the latter case, by facilitating the cleavage p100 to produce a p52/RelB complex that controls the formation of tumor initiating cell subpopulations in breast cancer . To dissect the role of FAK in NFκB signaling, we employed an NFκB-dependent luciferase reporter system. The level of NFκB activity was significantly decreased in FAK-null MEF (FAK-/-) as compared to MEF containing WT levels of FAK (FAK+/+) (Fig. 4d). Furthermore, re-expression of FAK180 could partially rescue NFκB activity in FAK-/- MEF (Fig. 4e). 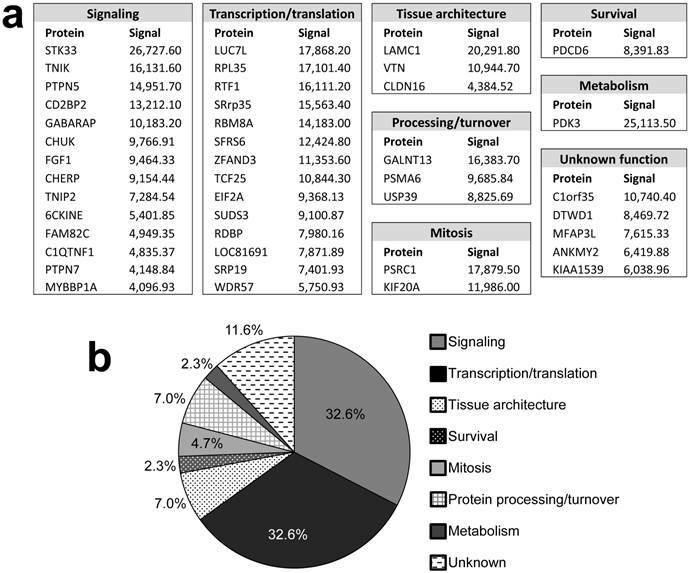 In the human breast cancer cell line, MCF7, treatment with the FAK kinase inhibitor PF-573,228 (PF-228) specifically inhibited induction of canonical NFκB signaling by TNFα (Fig. 4f). FAK also plays a regulatory role in the non-canonical NFκB pathway because its transient overexpression in HEK293T cells induced the cleavage of p100 to p52 (Fig. 4g). Consistent with this role, treatment of HeLa cells with PF-228 prevented p100 cleavage mediated by the non-canonical pathway inducer, Lymphotoxin β Receptor Ligand Light (heretofore called “Light”)  (Fig. 4h). Lastly, in order to address how FAK phosphorylation of IKKα facilitates NFκB signaling, the major FAK phosphorylation sites on IKKα were identified as Y187 and Y198, based on anti-PTyr IB analysis of HEK293T cells co-transfected with IKKα WT or individual site Y-->F variants plus FAK180 (Fig. 4i). In comparison to WT HA-IKKα or HA-IKKα500F (whose phosphorylation by FAK was not altered in Fig. 4i), HA-IKKα187F or HA-IKKα198F failed to induce NFκB signaling when transiently overexpressed in MCF-7 cells (Fig. 4j). Taken together, these data show that both canonical and non-canonical NFκB signaling are controlled by FAK, likely through the specific phosphorylation of IKKα. FAK phosphorylates vitronectin, PTPN5, and PDCD6. FAK-IVK reactions with VTN (a), GST-PTPN5 (b), GST-PDCD6 (c and e), using GST or GST-paxillin as negative or positive controls, respectively. Left panels (a-c): stained proteins; right panels: autoradiographs of FAK-IVK. d. IVK with purified Src or Pyk2 using GST, GST-paxillin, or GST-PTPN5 as substrates. e. IVK reactions with purified FAK, Src or Pyk2 using GST, GST-paxillin or GST-PDCD6 as substrates. FAK phosphorylates CHUK/IKKα regulates NFκB signaling. a. FAK-IVK reaction using HA-IKKα IPs, identified by anti-PTyr IB. b. FAK180 phosphorylation of HA-IKKα in HEK293T cells. c. IKKα functions in both canonical (left side) and non-canonical (right side) NFκB pathways. d. Relative luciferase units (RLU) of NK-Luciferase reporter (normalized to CMV-Renilla) in FAK +/+ vs. FAK-/- MEF. e. RLU (NK-Luc vs CMV-Renilla) in FAK-/- cells transiently overexpressing FAK180. f. RLU (NK-Luc vs CMV-Renilla) in MCF7 cells stimulated with TNFα (20ng/mL for 16 h). IB for active and total FAK (upper panel). g. FAK induces cleavage of p100 to p52 in HEK293T cells. h. p100 to p52 cleavage in HeLa cells ectopically expressing p100, after stimulation with 100 or 200 ng/mL Light for 16 h in the presence of either DMSO or 10 μM PF-228. i. Decreased FAK180-induced pTyr of IKKα187F and IKKα198F relative to WT or IKKα500F in HEK293T cells ("-", vector). j. Decreased RLU (NK-Luc vs CMV-Renilla) in MCF7 transiently expressing IKKα187F and IKKα198F relative to WT or IKKα500F (V, vector). Error bars for all experiments: SEM, three independent experiments. *, p<0.05; **, p<0.005 as determined by unpaired t test. The in situ FAK kinase assay using protein microarrays is a novel and viable means to identify FAK substrates. Using this technology we have confirmed phosphorylation of four novel substrates of FAK, demonstrated specificity among FAK family members, and implicated FAK in regulation of two major signaling pathways. This screen represents a major starting point for an in-depth understanding of FAK's kinase activity and its role in tumorigenesis. We thank Vita Golubovskaya, Xinjiang Wang, Andrei Gudkov, Andrei Bakin, Michael Schaller, Elena Kurenova for sharing reagents and cells. This work was supported by grants (I.H.G.) CA94108, CA116430 (National Institutes of Health/National Cancer Institute), PC074228, PC101210 (Department of Defense), and in part, through National Cancer Institute Comprehensive Cancer funds (P30-CA016056). Corresponding author: Irwin H. Gelman, Department of Cancer Genetics, Roswell Park Cancer Institute, Elm and Carlton Streets Buffalo, NY 14263, 716-845-7681, Irwin.gelmanorg.